Unfortunately, in this industry, renovation mistakes happen all too often. The frustrating part? They don’t need to happen! 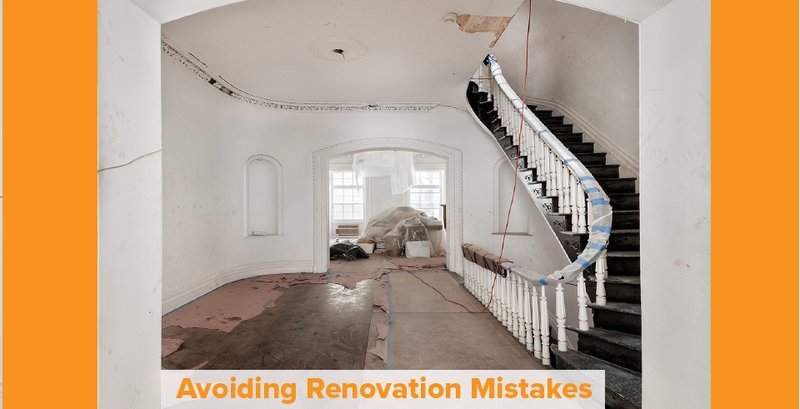 Renovation mistakes are simply just that- a mistake. And, there are always ways to avoid a mistake! The biggest way to avoid a mistake is preparation. A renovation takes a lot of preparation. It’s not something you want to just wing. You can’t just wake up one morning and decide to transform your entire kitchen. You need a plan! You need a thought process, ideas, inspiration, all things that lead to an end goal. You should be able to see on paper how your renovation is going to look, function and ultimately pan out- all before anything actually starts up in your home. Now that you know you want to make a renovation, now you can begin to dream up your perfect space. Here are some of biggest tips on how to avoid creating an ‘uh-oh’ moment in your home. Whether your home be modern, rustic, Victorian, Spanish, or whatever, you bought that home for a reason. You enjoyed the style of it. Don’t forget this when deciding to renovate. Make sure the renovation will still flow well with the rest of your home and that it still meshes with the style. Remember, you get what you pay for. If you want your renovation to last, if you want to increase the value of your home, don’t go with the lowest quality, cheapest item. Wait until you can afford the proper products for the job. If you’re going to take the time to do a renovation, you may as well do it correctly. It’s important to have a plan when it comes to your renovation. Understand the timing it will take and don’t be unrealistic. Sometimes it’s easier to break down your renovation into parts or segments. Completing your renovation in stages might be easier for you if you want to extend your budget, or don’t want to live in renovation chaos for a long time. It and might also ease your nerves a bit as well; only seeing parts of your home change, instead of everything all at once. People often underestimate what it’s going to cost to do a big renovation, and part of that is because they don’t realize the biggest cost in a renovation usually is the labor. A lot of work goes into a renovation and you never know what’s going to happen once you start the demolition process. As soon as you open a wall, you never know what you’re going to find behind that wall, so you need to be prepared for this, for your budget, and you need to be realistic. Another mistake that homeowners will often make is not taking into consideration the lighting in their home. The lighting in your home can completely change the colors, the feeling, and the ambiance. Never pick a wall colour at the store, take it home first and think about it in its everyday setting, in the room it actually will be in. Make sure what you pick isn’t something that will go out of style as quickly as it came in. You want this change to last you years and years to come. You want it to look great, in 1 year, 2 years and many years down the road.